KINGSTON, Jamaica, Sporting Alert – Here are the complete results from Day 1 of the Jamaica 2016 Carifta Trials at the National Stadium in Kingston, on Saturday, March 5. Several highlighting moments came from the meet, but as expected, the main headlines came in the sprinting events. 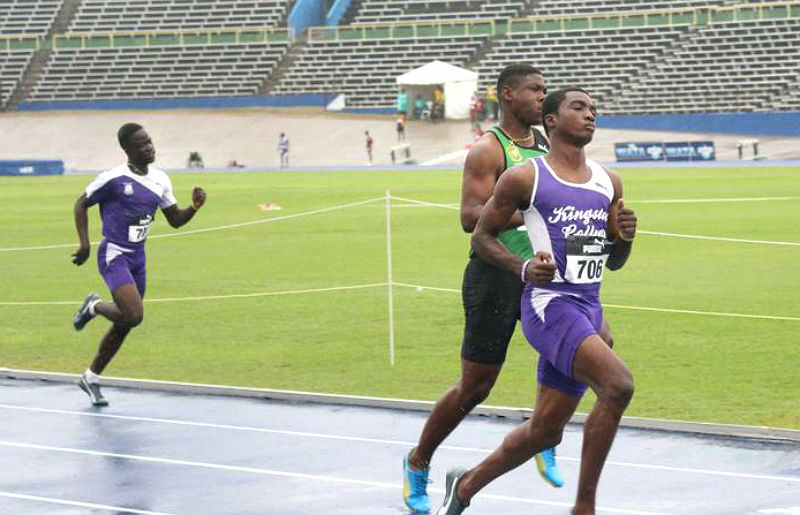 A number of eye-popping performances developed in the men’s short sprints, with Kingston College star sprinter Jhevaughn Matherson producing a new National Youth record of 10.25 seconds when racing away with the Under-18 100 metres. Matherson hinted during the build-up that he was in very good shape to lower his personal bests this season and his 100m run couldn’t have come at a better time for the 17-year-old who had entered the Carifta Trials with a previous best of 10.37 secs. After clocking 10.66 secs to win his heat, Matherson went significantly faster in the final to race away from Calabar’s Dejour Russell, who also set a personal best of 10.39 secs for second place. Another strong performance at the meet on the boys’ side came from St Elizabeth Technical star sprinter Nigel Ellis, who landed the Under-20 Boys 100m with a time of 10.26. St Jago High’s Raheem Chambers, who previously held the National Youth 100m record before Matherson lowered the mark, finished second to Ellis in 10.32 secs while Calabar’s Xavier Angus took third in 10.51. On the female side, St Jago’s Kimone Shaw flashed to a wind-assisted 11.51 (+2.5 m/s) seconds to dominate the Under-18 girls’ 100m. Shaw raced away from Michae Harriott of Holmwood Technical, who ran 11.93 for second and Mount Alvernia High’s Kemba Nelson, 11.94. Patrice Moodie of Edwin Allen High secured the Under-20 girls’ 100m in a time of 11.56 seconds, defeating Shanice Reid from St Jago High, 11.79 seconds. Elsewhere, on the opening day at the Jamaica Carifta Trials, Junelle Bromfield won the Under-20 girls’ 800m final in 2:06.61 while Shevan Parkes of Bellefield High took boys’ Under-20 final in 1:51.27. Meanwhile, Akeem Bloomfield of Kingston College cruised into the final of the Under-20 boys’ 400m with a time 47.44 secs. Bloomfield, who owns a personal best of 44.93, is the overwhelming favourite to win the final.